The autobiography of British motorcycle road racer, Maria Costello MBE, takes you through the journey of a petite blonde into the male dominated world of racing. Maria walks through her life story from awkward teen to record breaking racer, recounting the struggles, the gory injuries, and the difficult relationships endured along the way to Isle of Mann fame and Guinness Book of World record titles. Each chapter details the pains in being knocked down and having to rebuild herself back up, not only from the physical injuries, but from the mental ones as well. Her decade-long career has seen the loss of racing mentors and near-death experiences of her own. But the successes and the accomplishments outweigh the hardships for Costello, as she persevered on to become one of Europe’s top Motorcycle racers, earning countless trophies and the honor of being named Member of the Most Excellent Order of the British Empire (MBE). Maria tells a very honest and candid account of her life story, detailing the passion and interest that she possessed for motorbikes from a young age, of having to first overcome the objections of her parents and family before moving onto the constant objections of the male-dominated motorsports world. The story was filled with funny accounts from her early years, the often painful recollections of her many crashes and injuries, and some of the more personal details of her private life and the difficult chore of balancing them with her racing dreams. I really appreciated not only her racing history retold, the struggles, and the inner workings of race sponsorship and paddock culture, but also her mindset and resolve required entering the motorsports world and its effects on her personal relationships. I think it is a story that women in motorsports of all forms can relate to in one fashion or another, and one that isn’t often discussed publicly. At times, the book detailed far too many switches between classes and motorcycle models that the average reader may find themselves lost in, or not fully be able to appreciate the importance or differences between the models and their respective power, engine displacement and relative size. It also was a bit out-of-sync on the chronological order of events at times, jumping forward and back in events, but only mildly scattered and not difficult to follow. Overall, I really appreciated reading about Maria’s obvious passion and dedication to her sport, and found the book very easy and engaging to read. I found the book very relate-able for Women in Racing and the motorsports world, and could identify with many of the insecurities and the passionate drives that she discussed in her journey. 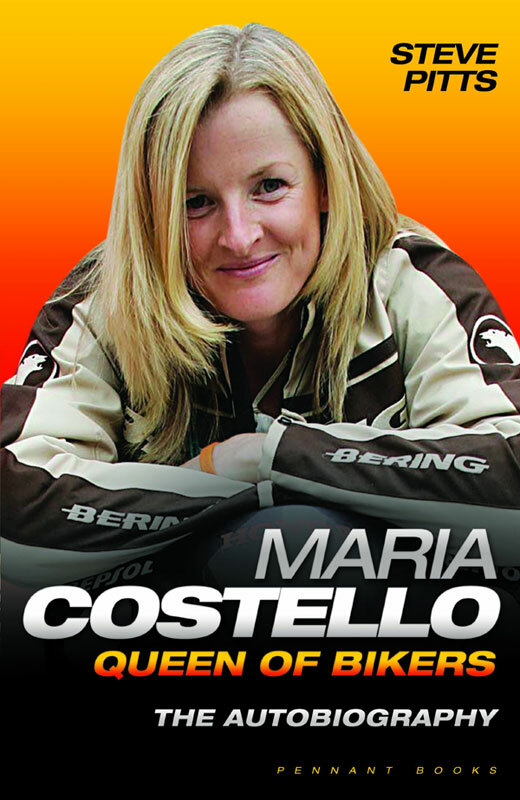 I think “Maria Costello: Queen of the Bikers” is a wonderful read for fans and racers alike, and that her story goes beyond that of a sports autobiography or a motorsports fare, extending as a tale of a woman’s lone defiant struggle to succeed in a hostile and dangerous male world.